The stories of the season. They have become the casualties of familiarity, reduced to mere words, adapted to plays, concerts and seasonable objects of display. I have often used the phrase beyond the words to express my desire to know more and be challenged by the word. One such story of course is the birth of our savior, Jesus Christ. To me to preface the birth with the word story, leaves much to be desired as to the importance of God coming among us. So join me as I go beyond the words.First we see the lives of Joseph and Mary disrupted by civil responsibilities decreed by the Roman Government. I am sure it was not the wish of either to be traveling at this time. They had no choice as it had been ordered by Rome. The census was an institution of Servius Tullius, sixth king of Rome. The design of the census or enrollment was to record an account from the people who were ordered to give their names, quality, employments, wives, children, servants, and estates holdings. The value set upon the estates by the censors, and the proportion in which they adjudged them to contribute to the defense and support of the state, either in men or money, or both. We might even be tempted to ask why would Mary risk such a trip at this time in her pregnancy? There was no reason for Mary to have gone to Bethlehem, as Joseph’s presence could have answered the questions without Mary. Scripture answers that question for us. In going the prophecy of Micah would be fulfilled, and that Jesus should be born in the city of David; Micah 5:2. With this information we are made aware of the reality of the day, so to speak. Joseph and Mary were ordinary people called by the grace of God to be part of an extraordinary event. We should be aware that God could call on any of us to be part of a kingdom event at any time in our lives. There has always been many different pictures presented of the birth place of Jesus but while many historical descriptions vary somewhat the one I find most accurate in this case is as follows. The term laid him in a manger in that day would have meant not only the, manger which can also refer to a feeding trough but the entire stable. Why there? To start with the crowds traveling to Bethlehem would have been huge, everyone going to comply with the census. Was Joseph so poor he could not afford a room? Maybe not, some writings indicate he was a success at his chosen profession, given the crowds it is not hard to understand why there would be no room available. Again, God coming among us in such ordinary circumstances. There are many details here yet to be discovered but I will move on to the next defining moment of this story. In verse 8 we read of shepherds abiding in the field close to their sheep. Historical writings from this period would indicate that they most likely had tents or booths under which they dwelt. We are further drawn into the narrative with the well-known phrase keeping watch by night. A normal watch would be about three hours at a time per man. The reason being to protect the sheep from beasts of prey and even more revealing from groups of roaming bandits which at that time Judea was infested. Why is this important? It points to how ordinary life was difficult at this time while making it plain this was a normal circumstance at this time. We live, most of us, a very ordinary life day-to-day. When the day comes for our Lord to return it most likely will be during a time of our living out another ordinary day. 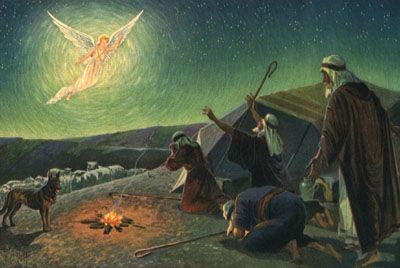 Will we fear at that moment the divine justice to come as most likely those shepherds did when the Angels announced his coming or where they even able to comprehend what was happening? These are just a few random thoughts about this story and I might add one more. It was the custom of the Jews that when a boy was born local musicians would gather at the house and greet him with simple music. Jesus’ birth in a stable in Bethlehem made this impossible . Instead the angels sang the songs for Jesus that the earthly singers could not sing. This is an account of God incarnate coming to this earth to live among his people, claiming no special privileges and experiencing the life of ordinary people. We might ask ourselves have we who are born again, squandered our new birth right to the sins of this world?